An estimated 6 to 10 million homes in the US still get their water from aging lead service lines (LSLs) – the lead pipes connecting the water main under the street to homes and other buildings. As the primary source of lead in drinking water, eliminating LSLs is essential to protecting public health and responding to community concerns. Communities across the country are taking on the challenges posed by LSLs. EDF considers it important to recognize those leaders who are taking action. In a past blog, we highlighted the work of the Lead Service Line Replacement Collaborative and its 25 members, including EDF, in developing a toolkit to help communities accelerate replacement of LSLs. Additionally, the American Water Works Association – the main organization for drinking water professionals – deserves recognition for its declaration that LSLs need to be eliminated. 14 communities that have publicly set a goal of eliminating LSLs in their jurisdiction – which collectively represents more than 240,000 LSLs. Setting a goal of full replacement is a critical step in the process—while clearly much work remains to ensure that LSLs are safely replaced. 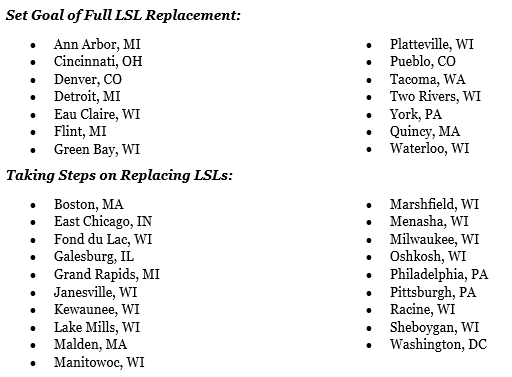 19 other communities that are taking important steps to replace LSLs, but may not yet be ready or willing to set a public goal of full replacement. The tally of communities is likely not comprehensive; we anticipate adding to each as more communities take action. We encourage users to fill out this survey if they know of a community LSL replacement program we have missed or not adequately described. Providing guidance to property owners. Developing and implementing an LSL replacement program is a complicated process, made challenging by many factors that include: service line ownership, the cost of replacement, and inconsistent recordkeeping of service line material. Many communities have found creative and innovative solutions to deal with these challenges and others are working to develop solutions. By recognizing and describing the efforts of these communities, EDF hopes both to highlight progress made at the local level on LSL replacement and provide a resource for other communities interested in getting the lead out of their water systems. Learn more about each community and additional background on LSL replacement. This entry was posted in Drinking Water, lead, Uncategorized and tagged lead, Lead Service Lines. Bookmark the permalink. Both comments and trackbacks are currently closed.